Born 29 July 1956 in Clifton, Nottingham, Nottinghamshire [registered in Nottingham, September 1956]. Some sources, like is own autobiography, state 29 July. The PFA states 29 August 1956. Another source, Football Unites, Racism Divides states 29 November. Viv himself, personally stated, says he was born on 29 July 1956. Covers the distinguished career from 1974 of the England international right-back during his playing days with Nottingham Forest and Arsenal before his 1987 move to Manchester United. This publication pre-dates his time with Sheffield Wednesday and subsequent move into management. - A Football Compendium, Peter J. Seddon (1999). Club(s): Played schoolboy football in Nottingham before joining Nottingham Forest FC as an apprentice, turning professional in August 1974. He played in 328 league matches, scoring fifteen times. Joined Arsenal FC in July 1984 for £275,000 and featured in another 120 league appearances, scoring nine. Joined Manchester United FC as Alex Ferguson's first signing in May 1987 for a tribunal-set fee of £250,000, going on to play in 54 league matches, scoring three. Anderson left on a free transfer, joining Sheffield Wednesday FC in January 1991, playing another 70 league matches, scoring eight. He joined Barnsley FC in June 1993 in the role of player-manager, playing twenty league matches, scoring three. Played for Middlesbrough FC in 1994-95. Played twice in the league, then retired from playing at the end of the season. Individual honours PFA Division One Team of the Year 1978-79, 1979-80, 1986-87; Awarded the MBE 31 December 1999. Inducted into the National Hall of Fame 2004. One of 100 great black Britons. Club(s): Became the player-manager of Barnsley FC in June 1993. Resigned from his post less than a year later after narrowly missing out on relegation. Joined Middlesbrough FC as Bryan Robson's assistant, still registered as a player, and did so twice in the 1994-95 promotion winning season. Left the club in June 2001. First match No. 526, 29 November 1978, England 1 Czechoslovakia 0, a friendly match at Wembley Stadium, London, aged 22 years 123 days. Last match No. 634, 24 May 1988, England 1 Colombia 1, a Rous Cup match at Wembley Stadium, London, aged 31 years 300 days. Individual honours England B (seven appearances, two goals), England U21 (one appearance). Distinctions First BME player to appear for the England senior team. History was made on an icy cold, dank Wembley evening [in November 1978]. 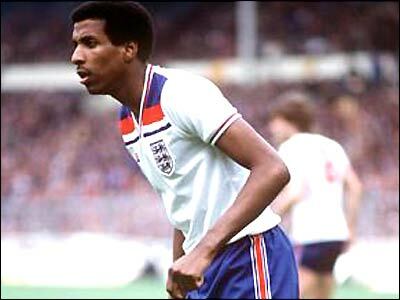 Viv Anderson, then a key part of Brian Clough's newly promoted Nottingham Forest side that was taking the top flight by storm, was selected at right-back by manager Ron Greenwood for England's friendly against reigning European champions Czechoslovakia at Wembley Stadium. Nowadays, the colour of a player's skin doesn't warrant so much as a passing mention in the media, but in 1978, at a time when black players were routinely abused from the terraces, Anderson's appearance grabbed the headlines. And while the game itself was a tepid affair, the then 22-year-old was inadvertently blazing a trail in which the likes of John Barnes, Ian Wright and Paul Ince, England's first black captain, would follow. "The game itself was fairly non-eventful" Anderson recalls. "It was a cold evening and I remember one half of the pitch was soft, the other was hard - nothing like the green baize you see at Wembley these days. We had to change boots at half-time. Fortunately I had a hand in the goal and we won 1-0." If the game itself was nothing special, Anderson was acutely aware of its wider significance. "Of course I was, because it was a big thing at the time. There were no black faces on the football field. "Ok, there was Brendan Batson - and Clyde Best before him - but that was it. And to be the first black player to don an England shirt in a full international, I can see why people made a bit of a fuss." Anderson, who was Bryan Robson's assistant-manager at Boro from 1994-2001, cites Trevor Brooking and captain Kevin Keegan as being instrumental in helping him prepare mentally for the occasion. "They were the big players at the time and it was good to have them on hand to pass on some of their knowledge and experience. "I remember Bob Latchford telling me that I'd remember the night forever. He was right." And it wasn't just fellow pros who showed their support, as the England faithful made their voices heard too. "It was a very positive reaction from the terraces. To them, it was all about the football." Anderson went on to play 30 times for England, being selected for two World Cup squads. 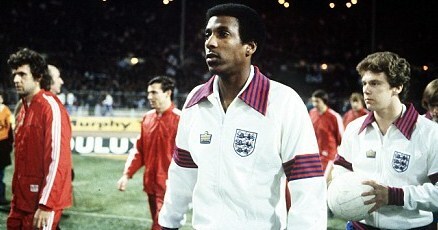 Thirty years later and England's....game against Germany in Berlin  saw seven black players make an appearance. He urges those currently on the fringes of the squad to be persistent in waiting for their break. "The likes of (Ashley) Young and (Gabriel) Abonglahor are talented individuals whose chance will come if their attitude is right. They need to listen to the older pros like I did and appreciate every ounce of time they have as part of the national set up. Anderson, who now works in events in Manchester and is an ambassador for the anti-racism body Kick It Out, looks back fondly on his England years. "I played in an age where it wasn't the norm for a black man to represent his country so to do it not just once, but 30 times, is more than I could've ever asked for." Kick It Out spokesman, Piara Powar, added: "Many of today's younger England fans will take for granted the black faces in Fabio Capello's team. But in 1978, it was a rarity to see a young black man achieving so highly, both on the football pitch and society in general. This is a milestone for Viv, and gives the rest of us an opportunity to take stock of a significant turning point for sport in this country."